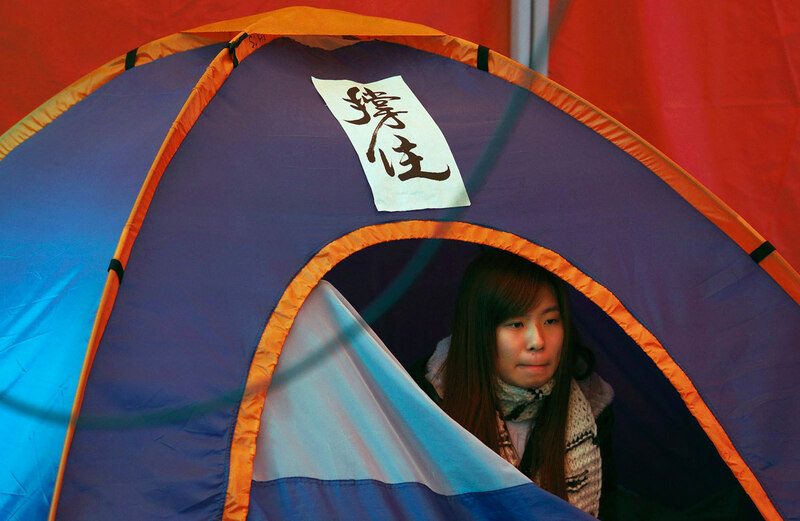 People gather at the pro-democracy movement's main protest site in the Admiralty district of Hong Kong on December 10, 2014. 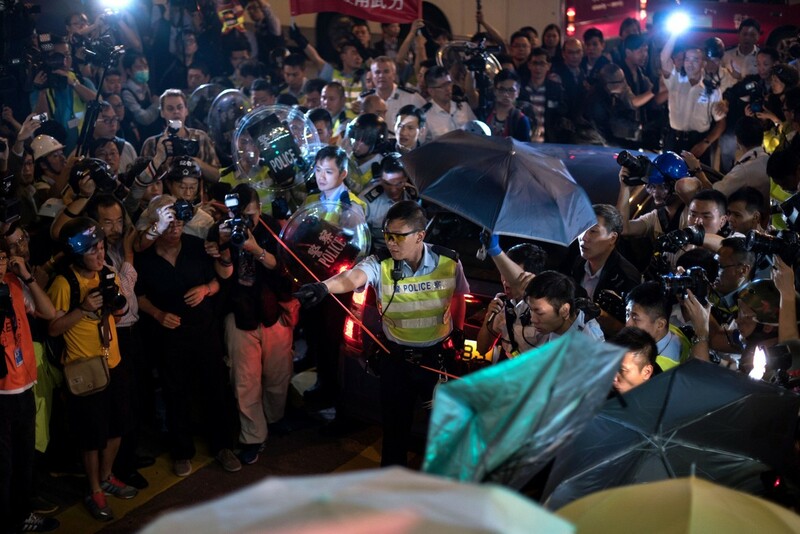 HONG KONG - Hong Kong urged pro-democracy protesters to pack up their tents and leave their main camp near government headquarters, saying it could not promise there would be no "confrontations" when the site is cleared on Thursday. 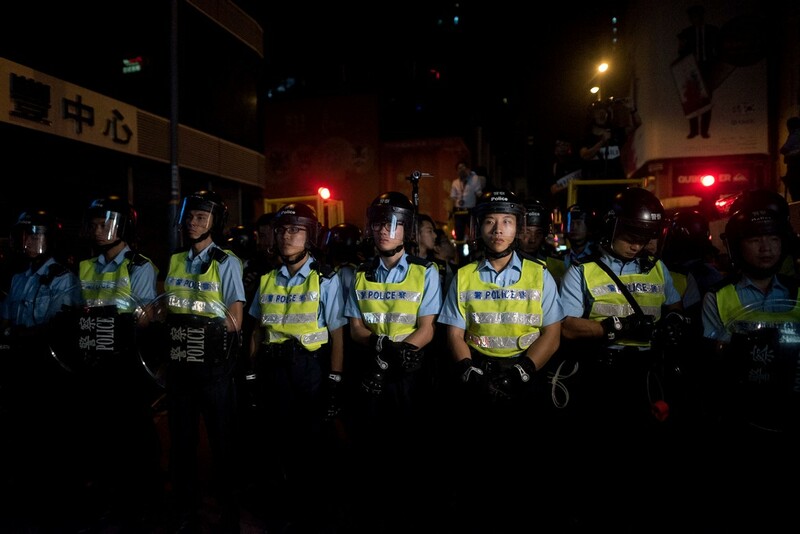 Thousands of police will move in on the site in Admiralty, next to the Central business district, after two-and-a-half months of road blockades and sporadic violent scuffles in the former British colony that returned to Chinese rule in 1997. 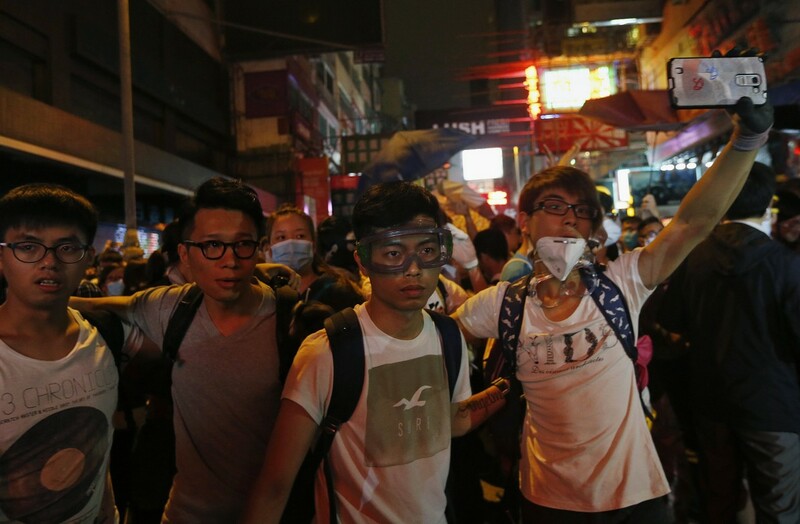 The protests, which have taken hold on both sides of the harbour, represent the most serious challenge to China's authority since the 1989 pro-democracy demonstrations and bloody crackdown in and around Beijing's Tiananmen Square. 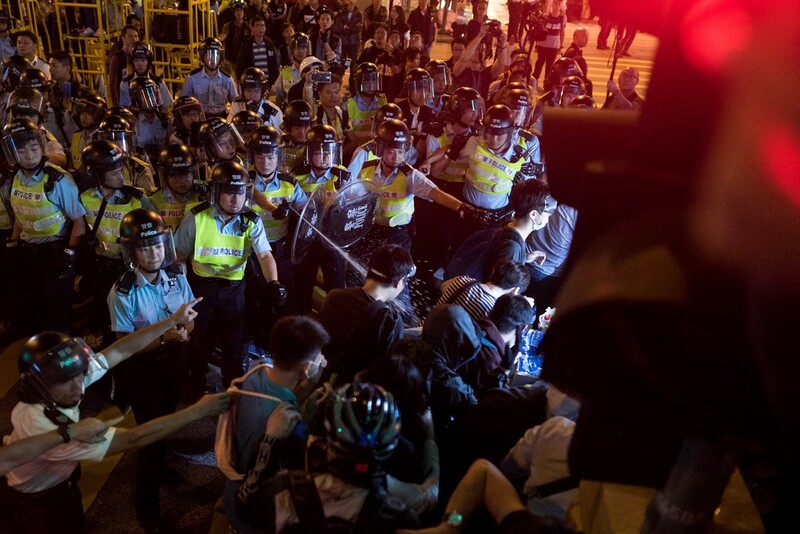 "We can't guarantee there won't be any confrontations,"Chief Secretary Carrie Lam, Hong Kong's number two official, told reporters. "I appeal to the protesters who have been illegally occupying our roads to pack up their belongings and to leave the protest sites." The Admiralty site has stood as a poignant symbol of calls for democracy that have been spurned by the government and Communist Party rulers in Beijing. "Our aim is to let the world see what we demand and most importantly, that Hong Kongers can unite," said protester Kenneth Kan. Some were packing up their tents on Wednesday, with some vehicles arriving to take away furniture and supplies. 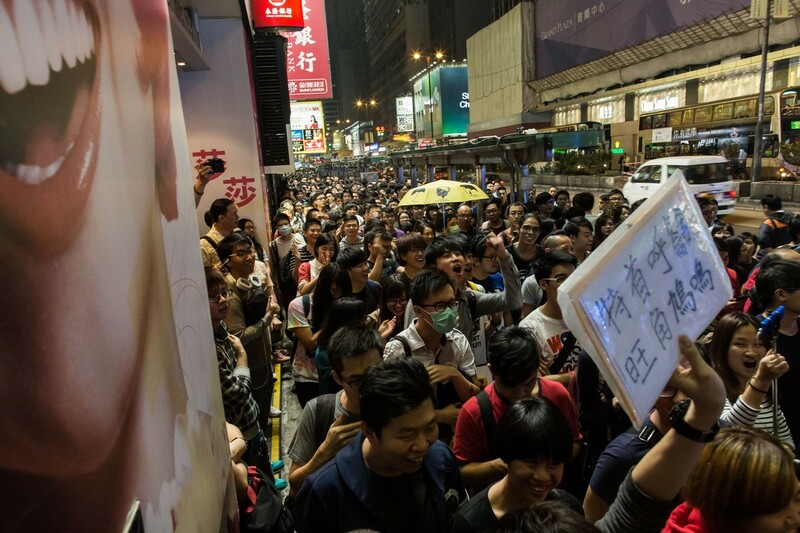 Others scrambled to preserve the "Umbrella Movement" artwork or snapped"selfies" and pictures on phones and cameras. "I came here sometimes afterwork but this is the first time for my son," said Alice Leung, accompanied by her nine-year-old. "He has seen the movement onTV but I want him to experience it himself so that he will understand better when he grows up and understand what democracy is." 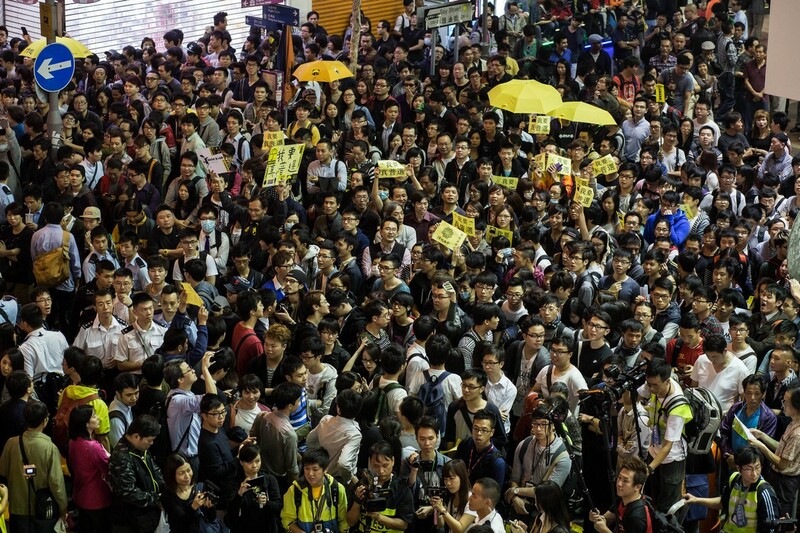 Many vowed to stay to the end, and the number of protesters swelled as thousands gathered after work and school. 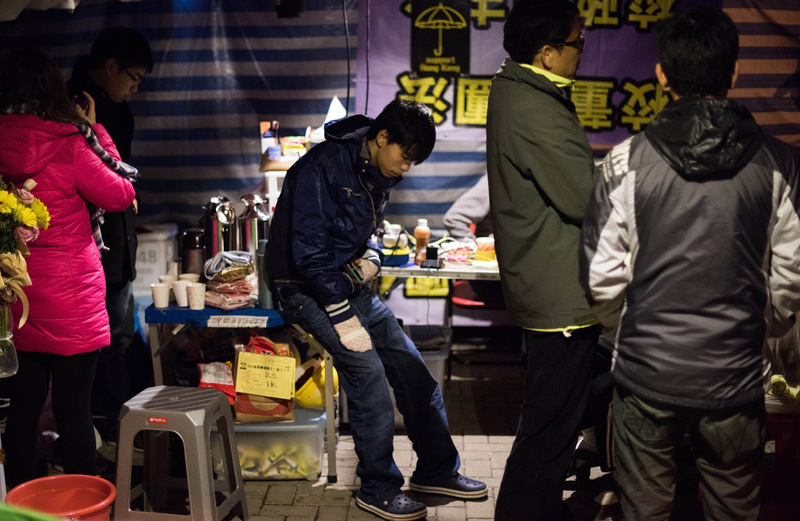 Joshua Wong is the teen face of the pro-democracy movement. 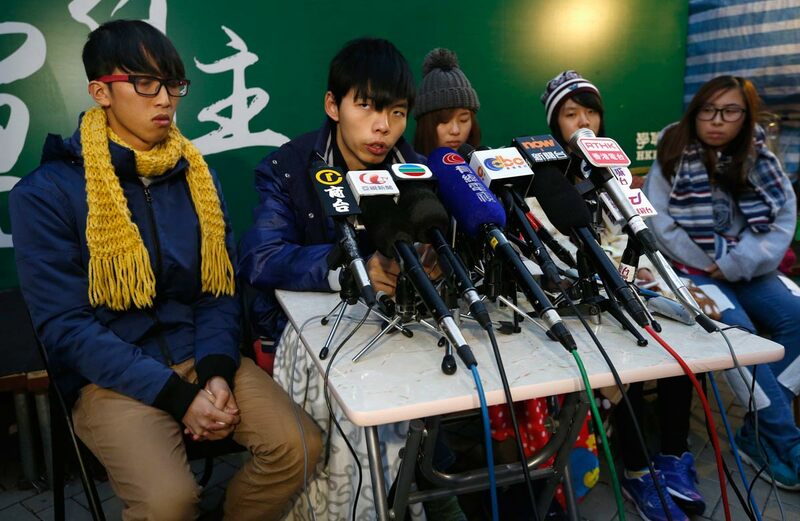 Joshua Wong said he has ended his four-day hunger strike. 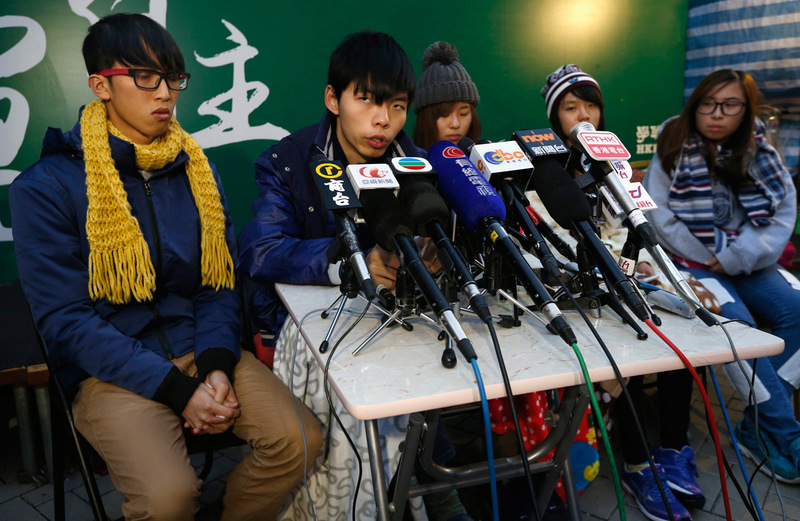 Joshua Wong said he was under strong urging by his doctor to end the hunger strike. 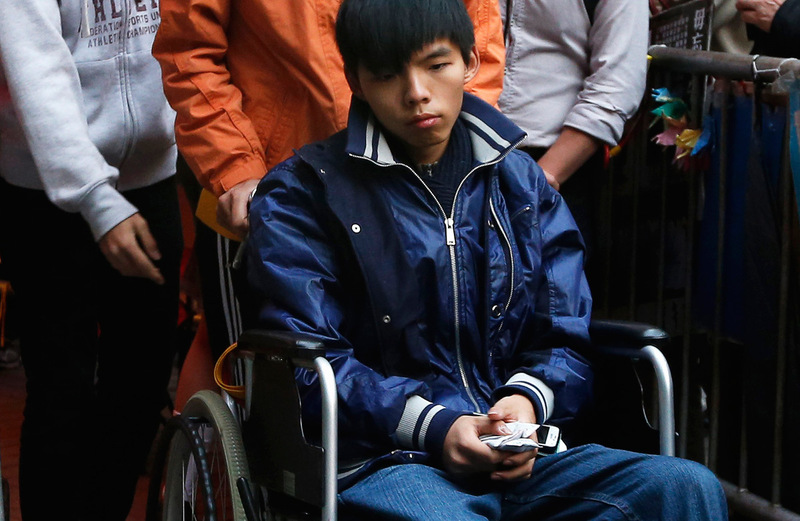 Joshua Wong, 18, said he felt extreme discomfort, dizziness and weakness in the limbs while on hunger strike. 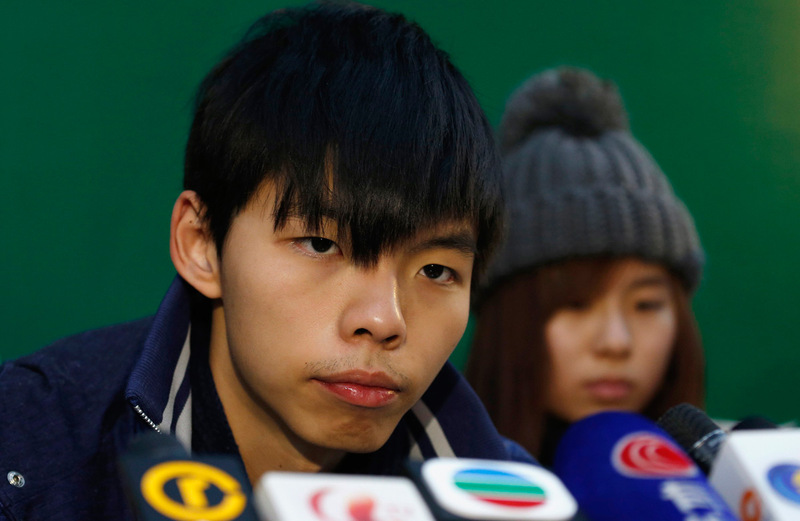 Joshua Wong told journalists that the government should not ignore the pro-democracy leaders' demands even when he had stopped the hunger strike. 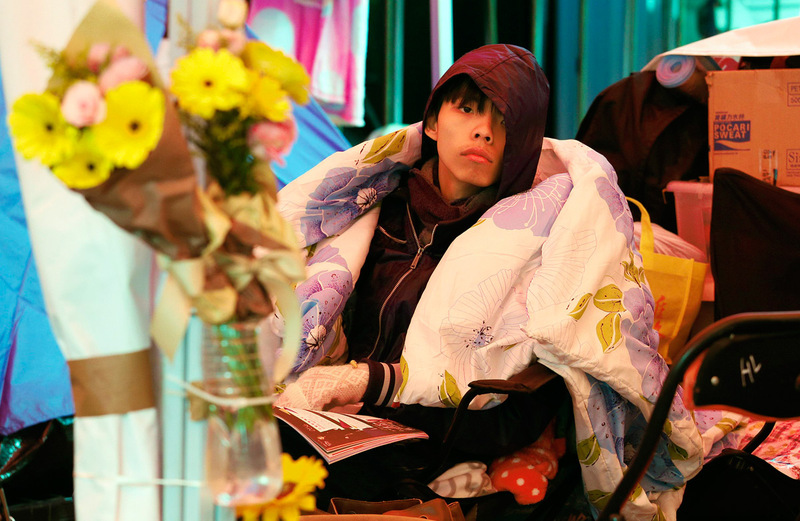 Joshua Wong's hunger strike was designed to force the government into further talks on political reform. 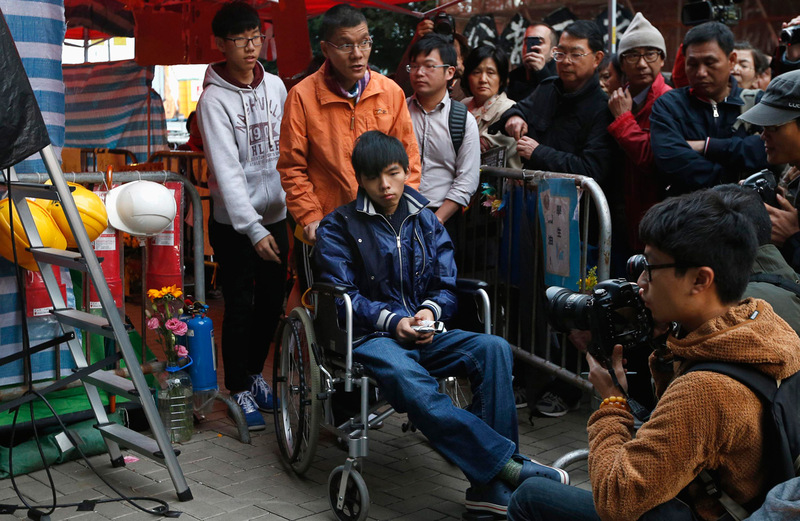 Joshua Wong had not eaten for 108 hours during the four-day hunger strike. 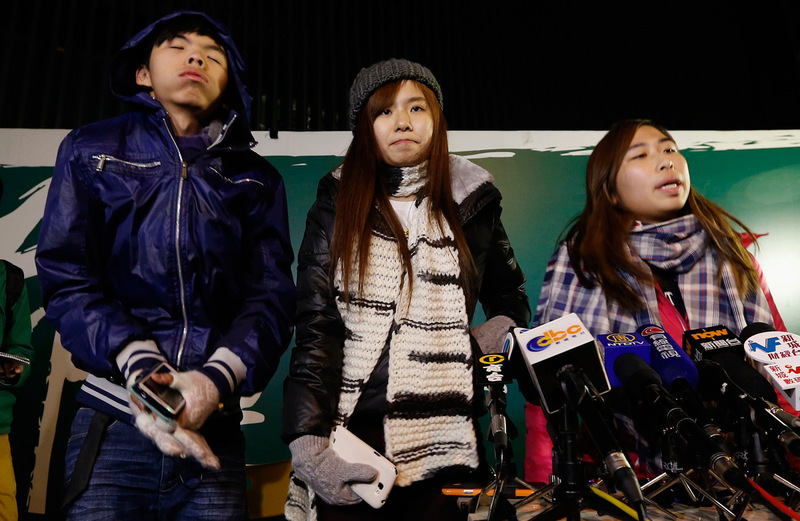 Two female members of Joshua Wong's group had joined in the hunger strike with him. The government had said it would not allow the hunger strike to affect its decision making. 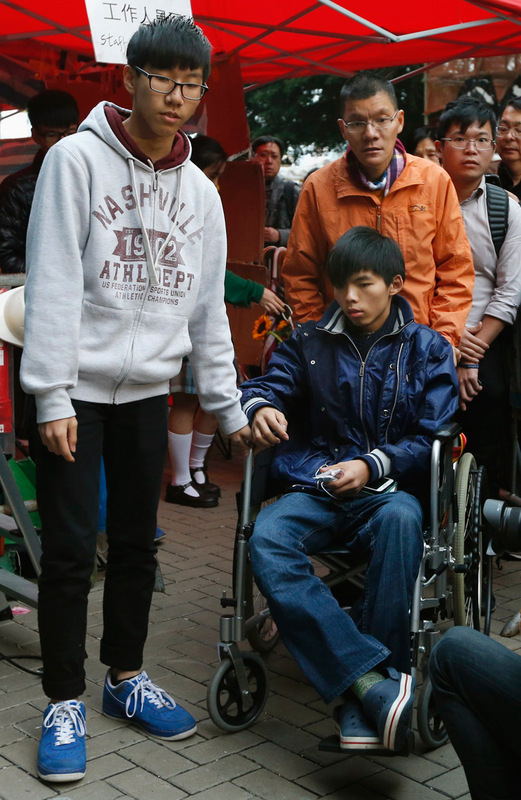 Joshua Wong was dizzy and weak during the four-day hunger strike. 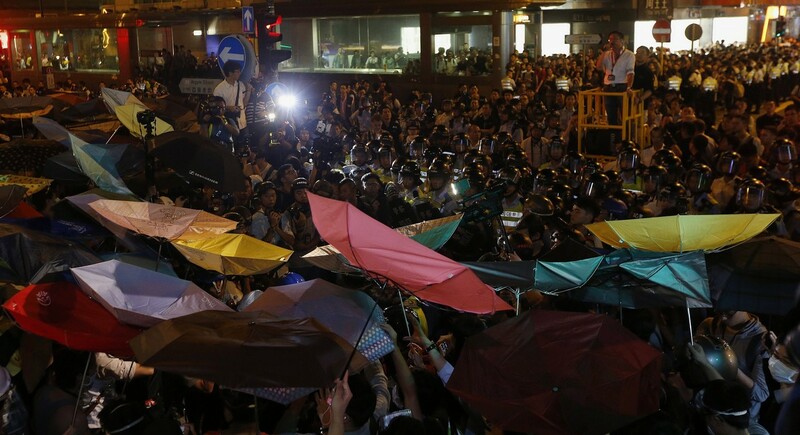 Hong Kong Federation of Students leader Alex Chow said his group and Scholarism, the other main student group backing the protests, were urging everyone who had participated to return to Admiralty on Thursday morning in an act of civil disobedience. "Some will fight back. 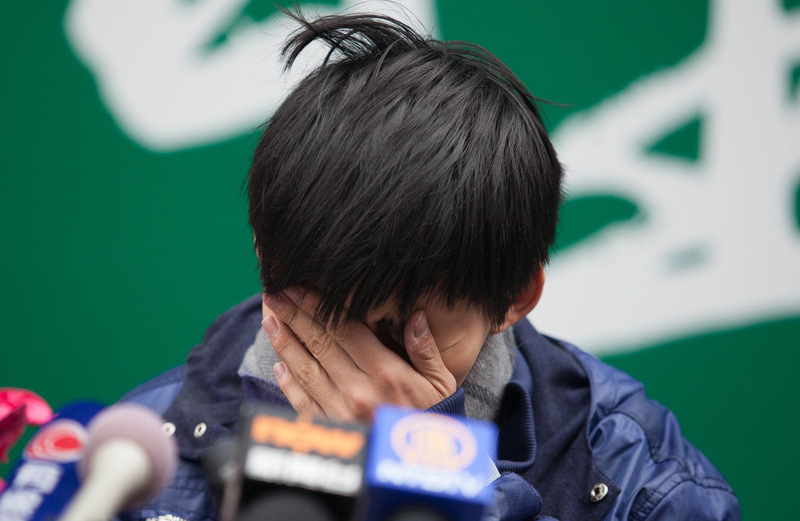 Some will sit down and wait to be arrested," said Johnny Chung, a 20-year-old student. "The government is ridiculous. Over 100,000 people came here and slept on the street ... and this government did nothing." Police sources said clearing the site would begin around 9 a.m. (0100 GMT). Describing tactics similar to those used to clear another protest site in the Mong Kok district two weeks ago, the sources said workers and bailiffs would first clear the areas subject to the court injunction, then, coming from multiple directions, cordon off the protest area and clear all barricades, tents and people in the roads. They may arrest those who refuse to leave. 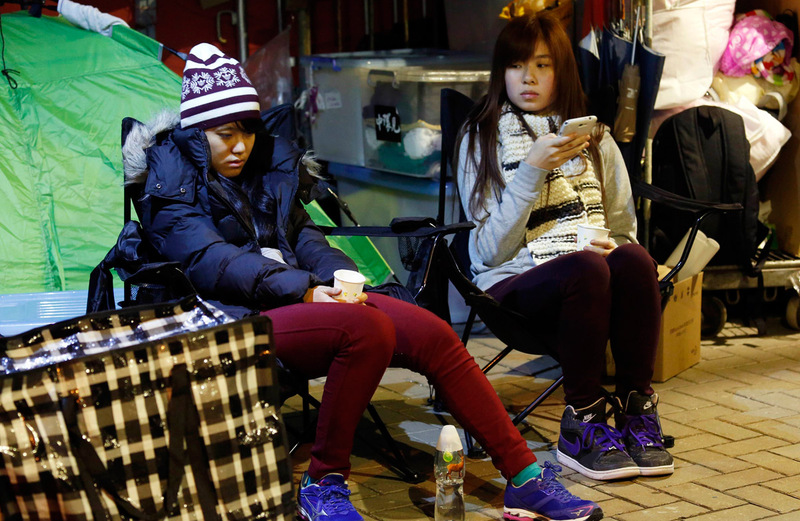 Causeway Bay would be cleared after Admiralty, either on Thursday or Friday, the sources said. Hong Kong returned to China under a "one country, two systems" formula, allowing it some autonomy from the mainland and a promise of eventual universal suffrage. Beijing has allowed a vote in the next election for leader in 2017 - but insists on screening the candidates first. 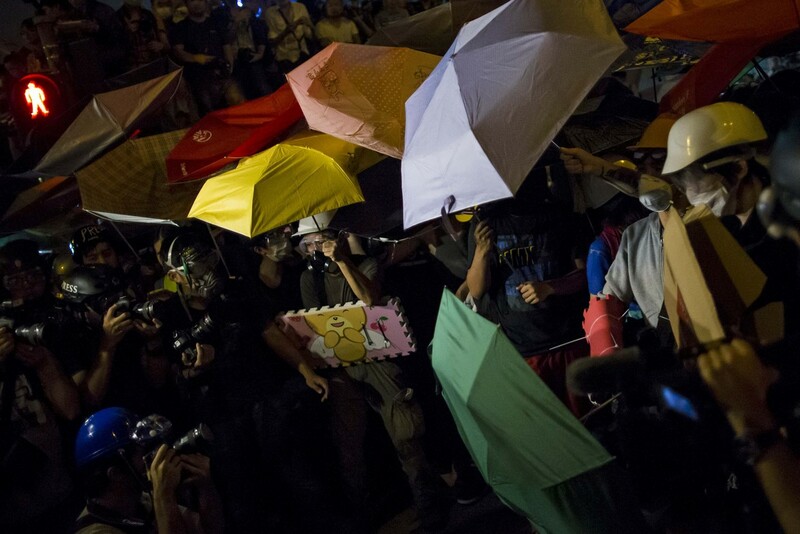 The Umbrella Movement, named after the items protesters used to defend themselves from pepper spray and batons, is demanding a fully democratic election with open nominations. 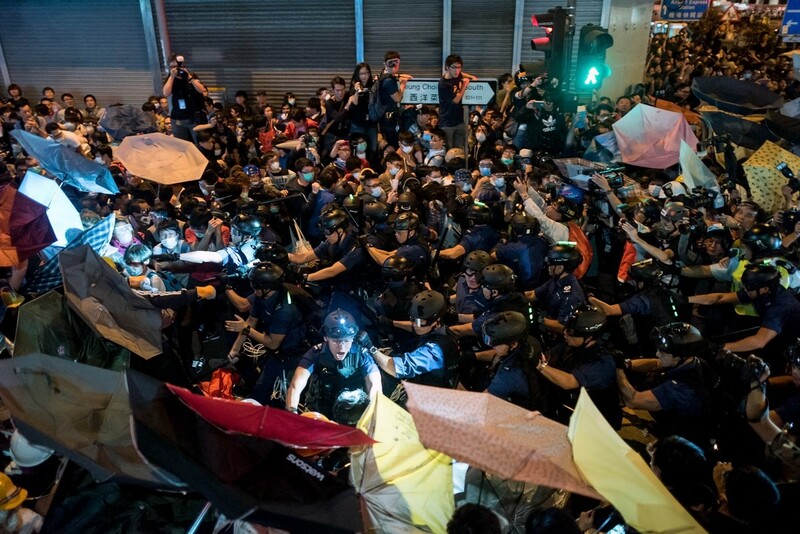 Admiralty is where police fired tear gas at tens of thousands of protesters in late September. That galvanised scattershot protests into a longer-term movement, complete with the democracy-themed artwork and statues, classrooms and food and medical stations. "We'll be back," proclaimed a large yellow banner hung along one of the pedestrian bridges. "Though we are disappointed, we must not give up hope," said another. "This movement is incredibly important," said Rose Tang, one of the student activists during the 1989 Beijing protests. "They are making history." But she urged protesters to depart without bloodshed. "Don't be a martyr, it is not worth it. Don't try to be a tank man," she said, in reference to a lone man who blocked a line of tanks near Tiananmen Square after the 1989 military crackdown. But she urged protesters to depart without bloodshed. "Don't be a martyr, it is not worth it. Don't try to be a tank man," she said, in reference to a lone man who blocked a line of tanks near Tiananmen Square after the 1989 military crackdown. 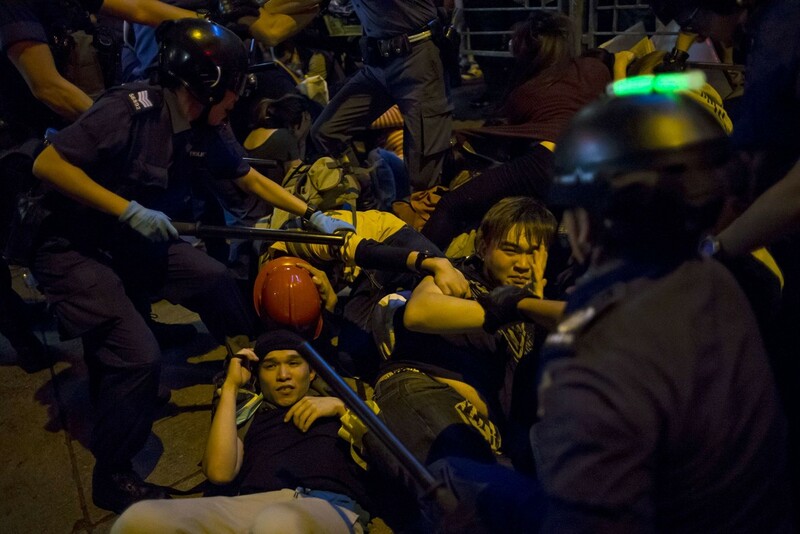 Pro-democracy protesters are pepper sprayed by police after they were told to disperse in the Mongkok district of Hong Kong on November 29, 2014. Thousands of pro-democracy activists clashed with police in running scuffles in Hong Kong's gritty Mong Kok district early on Saturday in a bid to reclaim part of one of the city's largest and most volatile protest sites. After a tense standoff lasting hours, chaos erupted as hundreds of riot police baton-charged demonstrators with shields, pepper spraying and wrestling a string of them to the ground. 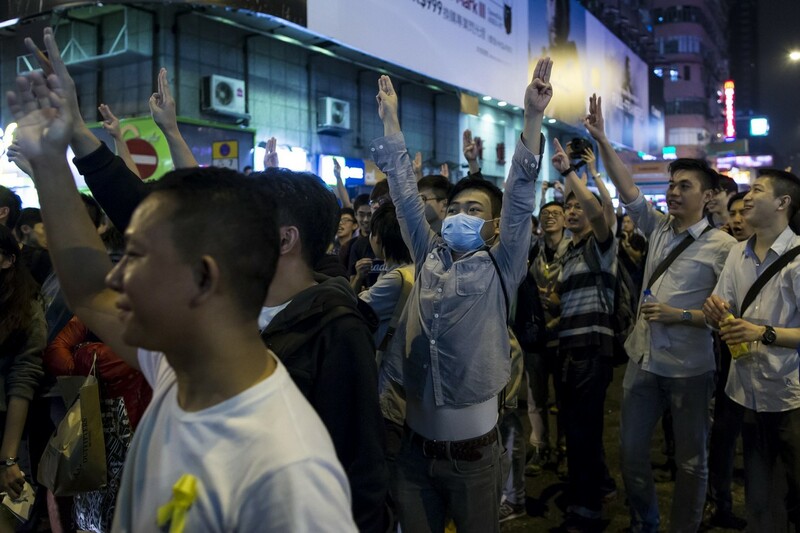 Pro-democracy protesters shout slogans as they walk along a main road that served as a pro-democracy occupy camp, before it was cleared two days ago by police, in the Mongkok district of Hong Kong on November 28, 2014. 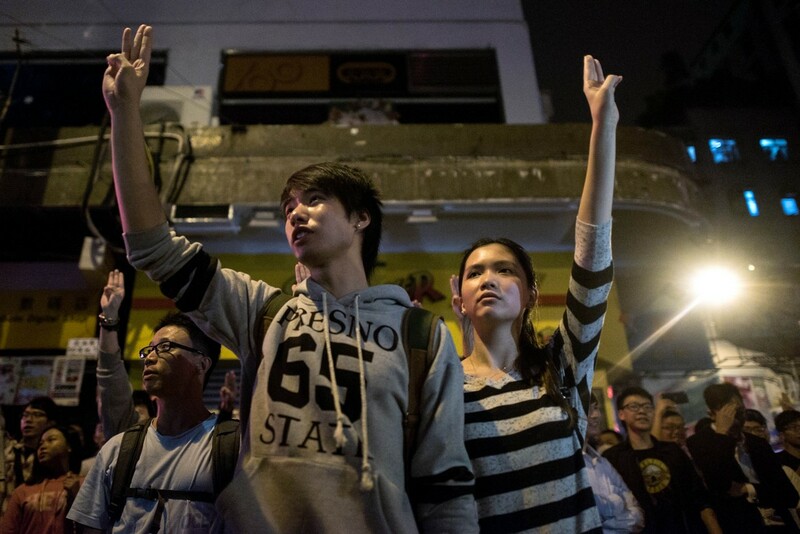 A police officer makes an announcement for a crowd of pro-democracy protesters to clear a road crossing in the Mongkok district of Hong Kong on November 28, 2014. The clampdown only stoked more protests, and a three-hour march by hundreds of people calling for "real full democracy"helped put the city's 28,000-strong police force further on edge. 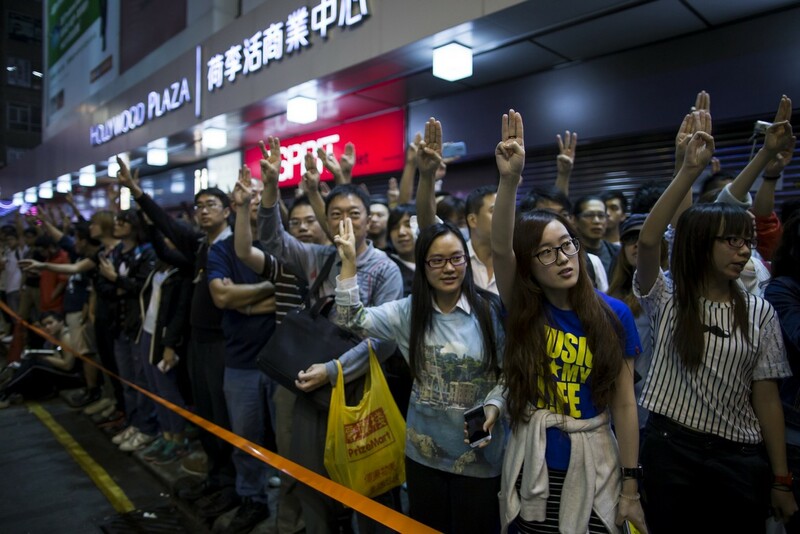 Pro-democracy protesters imitate a three-finger salute from the movie "The Hunger Games", at Mong Kok shopping district in Hong Kong November 28, 2014. 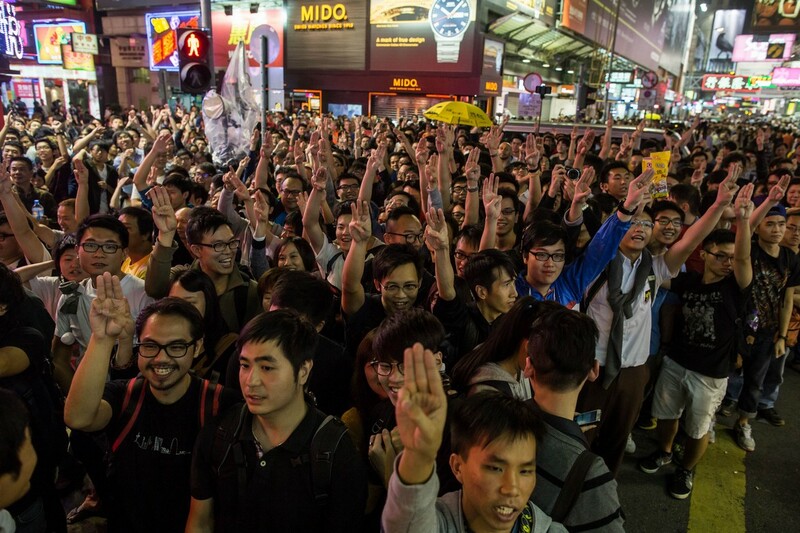 Supporters of the pro-democracy movement flash the three-finger salute from the "The Hunger Games" as a trailer of the movie is shown on the exterior screen of a theatre in street parallel to where a protest site was set up before being cleared off, in the Mongkok district of Hong Kong on November 28, 2014. 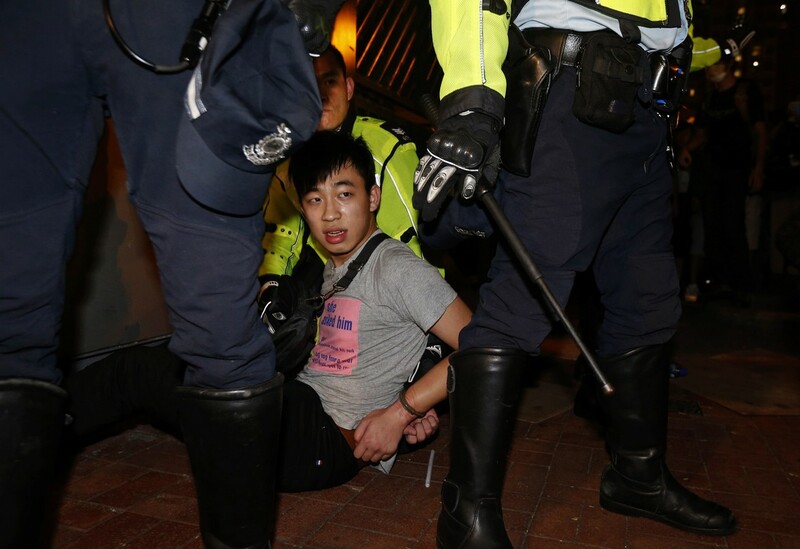 A pro-democracy protester is detained by police during a confrontation at Mong Kok shopping district in Hong Kong early November 29, 2014. 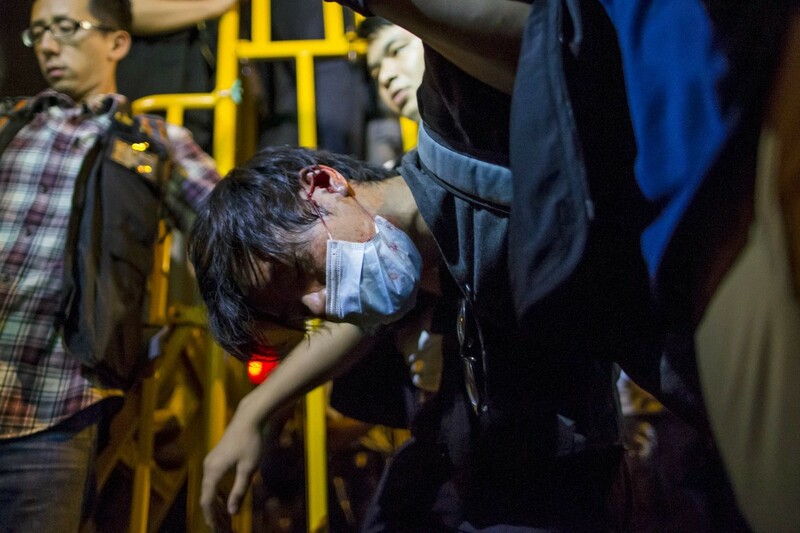 A pro-democracy protester, with blood on his face, is detained by police during a confrontation at Mong Kok shopping district in Hong Kong early November 29, 2014. Pro-democracy protesters fall on the ground as they are chased by riot police at Mong Kok shopping district in Hong Kong early November 29, 2014. 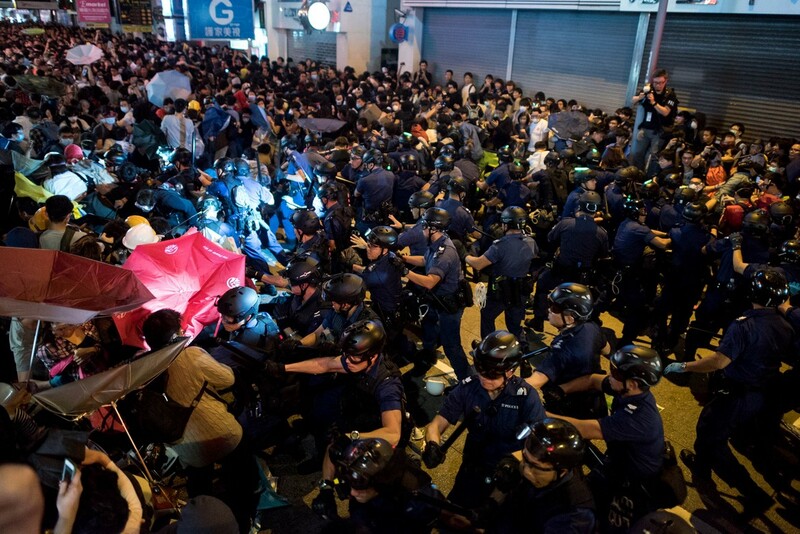 Riot police shout at pro-democracy protesters during a confrontation at Mong Kok shopping district in Hong Kong early November 29, 2014. 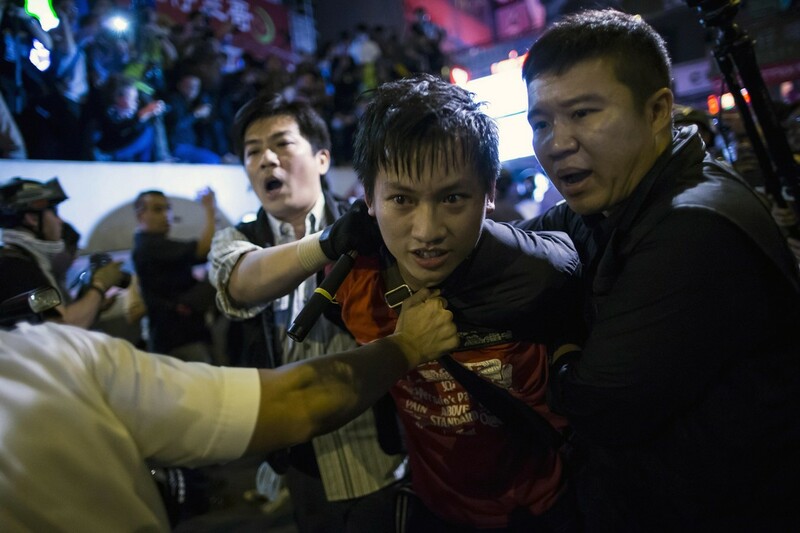 A protester is detained during a confrontation with the police as protesters try to block a side street at Mongkok shopping district in Hong Kong early November 29, 2014. 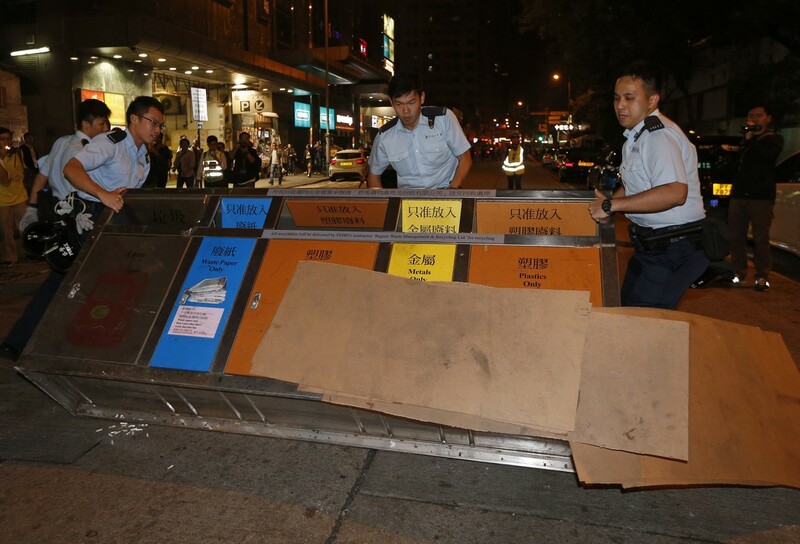 Policemen remove a litter bin after protesters used it as a barricade to block a side street at Mongkok shopping district in Hong Kong early November 29, 2014. 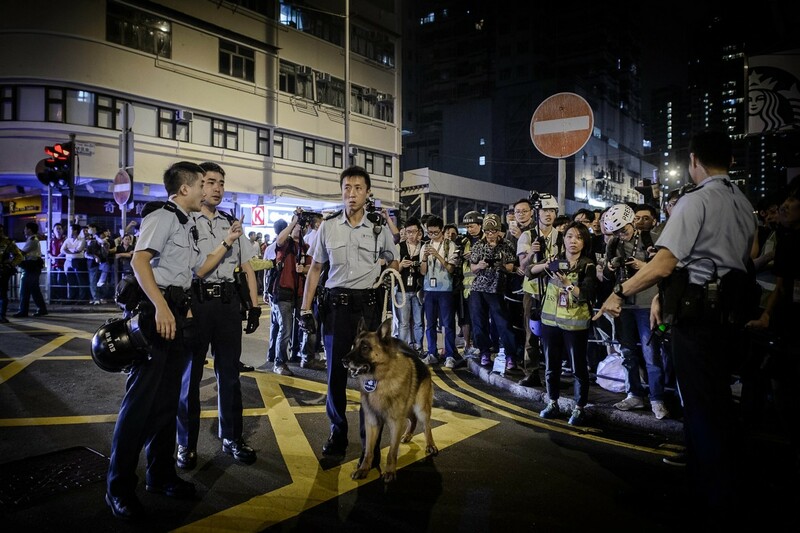 Policemen with dogs secure a street in the Mongkok district of Hong Kong on early November 29, 2014 . 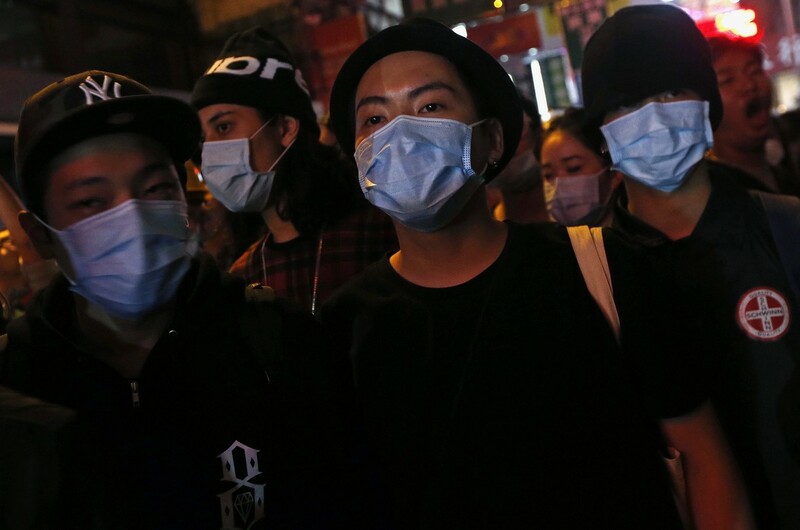 Pro-democracy protesters wear masks during a confrontation with the police at Mongkok shopping district in Hong Kong early November 29, 2014. 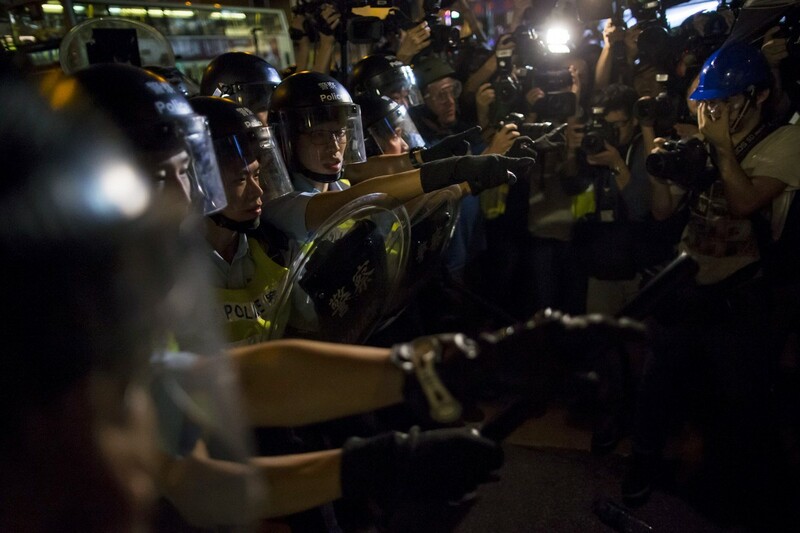 A pro-democracy protester takes a photo of the police (not in picture) near other protesters during a confrontation with the police at Mongkok shopping district in Hong Kong early November 29, 2014. 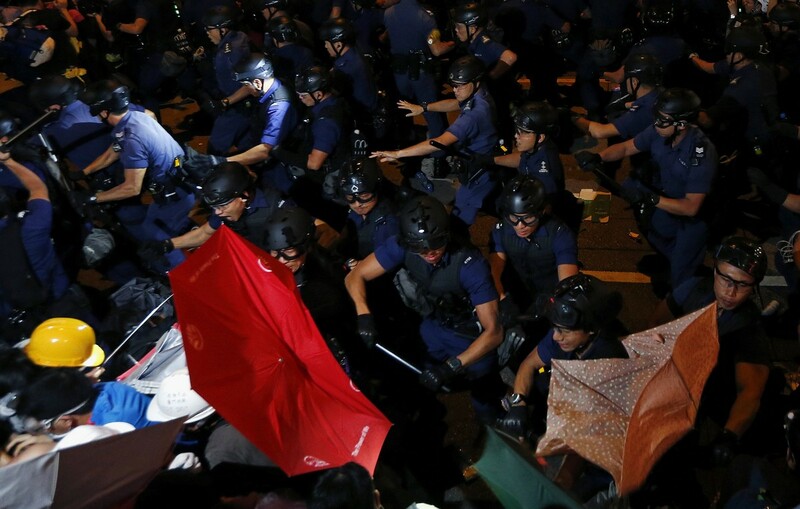 Riot police disperse pro-democracy protesters carrying umbrellas during a confrontation at Mongkok shopping district in Hong Kong early November 29, 2014. 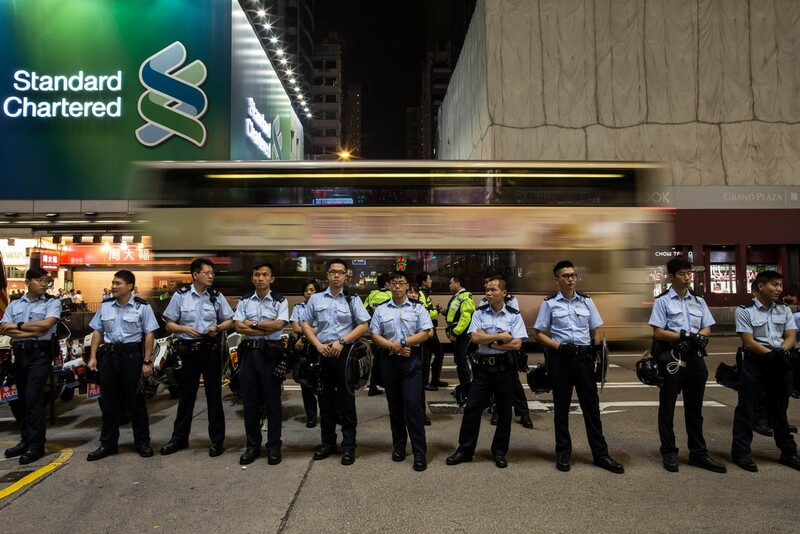 Police officers (R) confront pro-democracy protesters and call on them to disperse in the Mongkok district of Hong Kong on November 29, 2014. 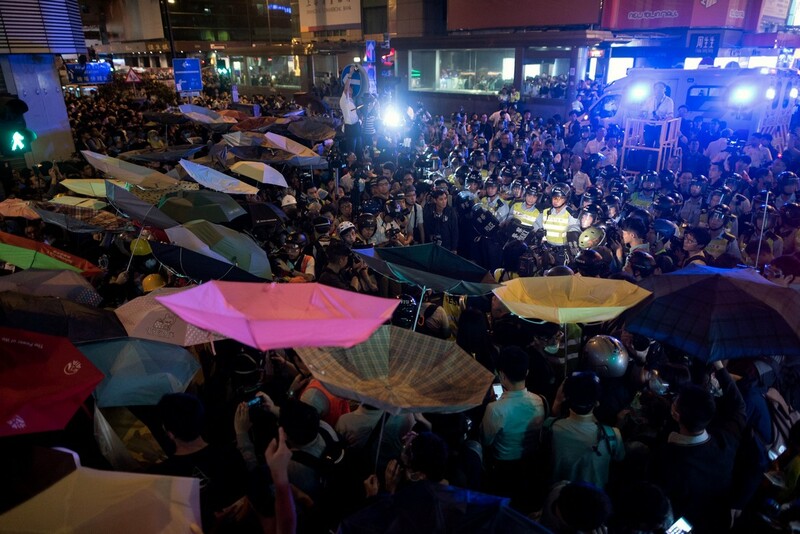 Pro-democracy protesters carrying umbrellas confront riot police at Mongkok shopping district in Hong Kong early November 29, 2014. 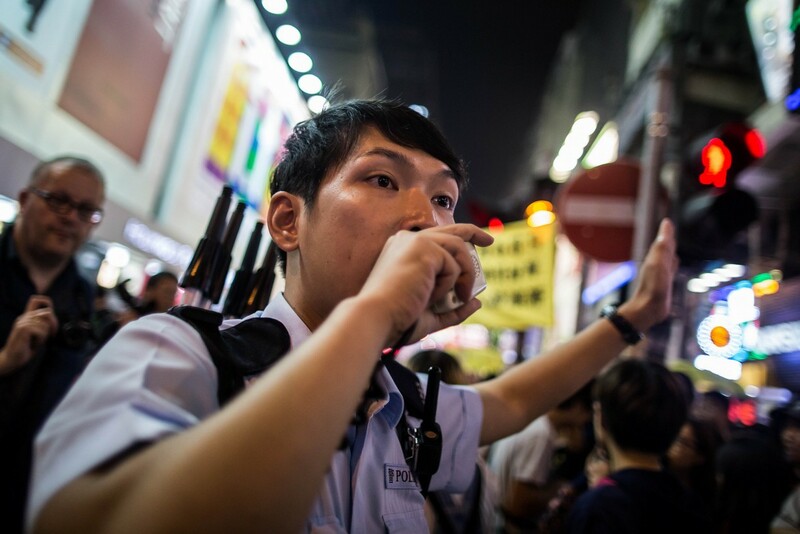 A policeman shouts at a detained protester during a confrontation at Mongkok shopping district in Hong Kong early November 29, 2014. 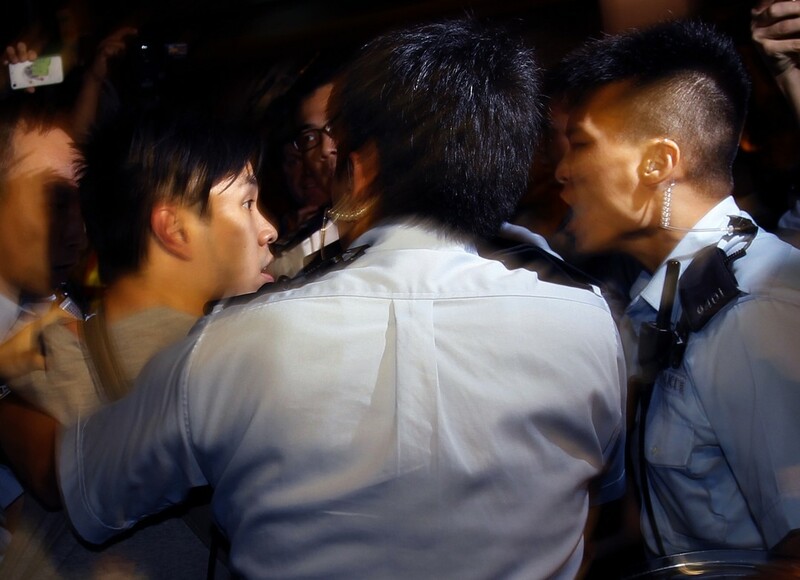 Police charge into a crowd of pro-democracy protesters after calling on them to disperse in the Mongkok district of Hong Kong on November 29, 2014. 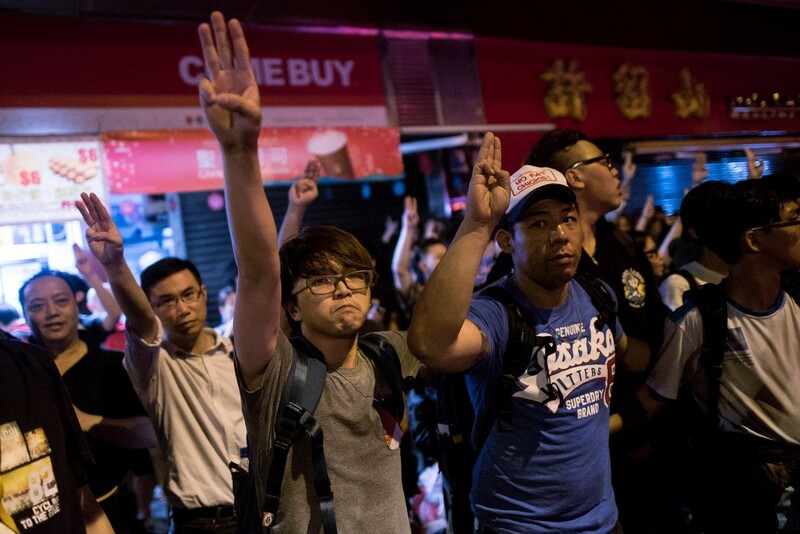 Pro-democracy protesters flash the three-finger salute from the "The Hunger Games" in the Mongkok district of Hong Kong on November 29, 2014. 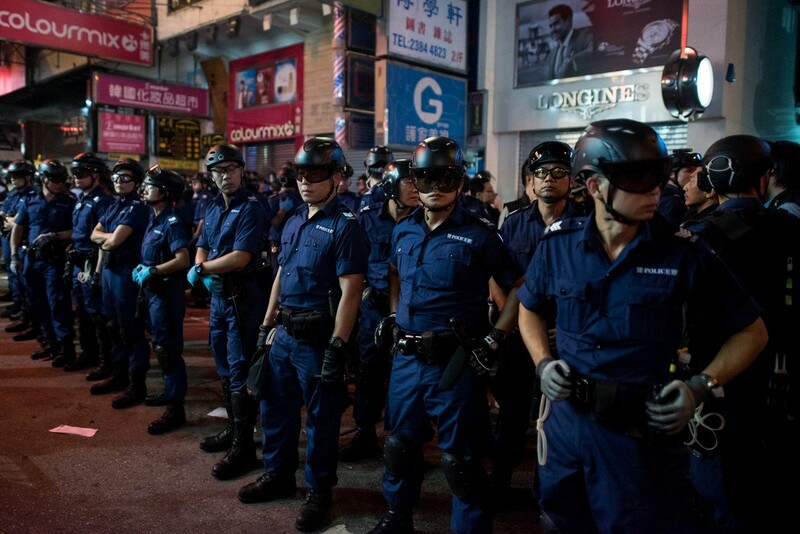 Police officers face off with pro-democracy protesters after calling on them to disperse in the Mongkok district of Hong Kong on November 29, 2014. 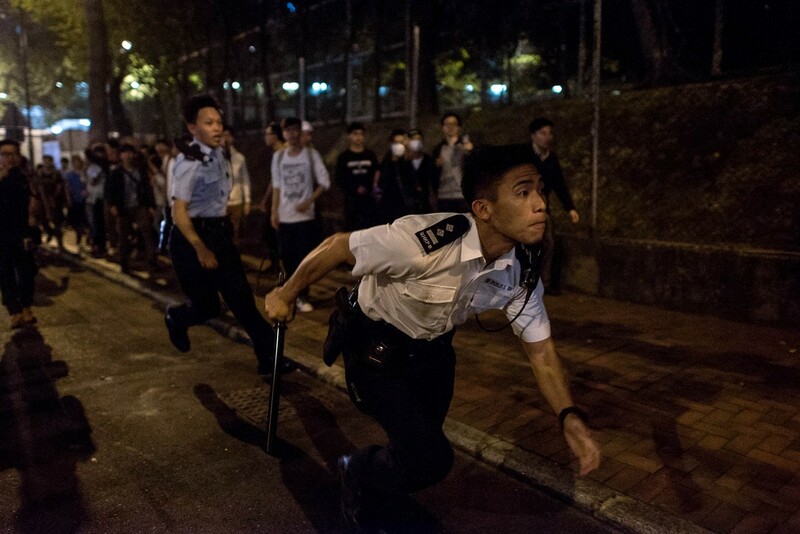 Police officers chase after a pro-democracy protesters who had tried to block a road in the Mongkok district of Hong Kong on November 29, 2014. 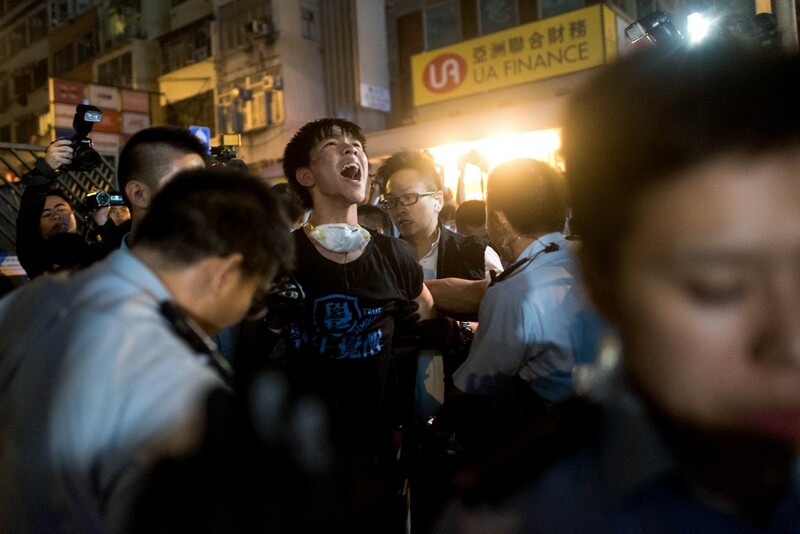 A pro-democracy protester shouts out as he is arrested by police in the Mongkok district of Hong Kong on November 29, 2014. 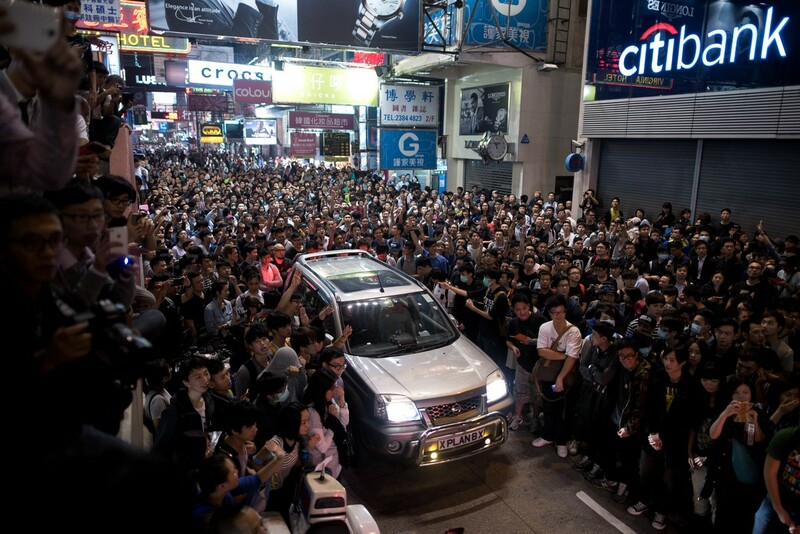 A car is driven through a crowd of pro-democracy protesters in the Mongkok district of Hong Kong on November 29, 2014. 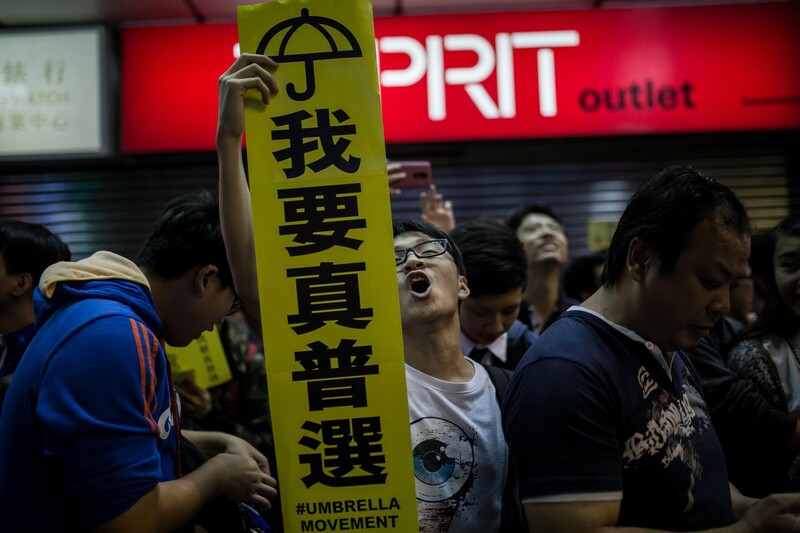 A pro-democracy protester (C) holds a sign for the Umbrella Movement as he shouts slogans in the Mongkok district of Hong Kong on November 28, 2014.